​You probably know the feeling - lying in bed for hours on end looking at the clock with the mind swirling, chattering and generally keeping you from falling asleep. You re-play the events of the day getting caught in circular thoughts like “Why did I say that?”, “Why didn’t I stand up for myself at work?”, or “How am I going to pay my bills?”. The frustration of insomnia spills over into the next day and you find yourself reaching for another cup of coffee to make it through the day. One in four Americans experiences insomnia every year, with 75% of those sufferers recovering without developing chronic insomnia. For most people, a good night’s sleep will set us right when we experience occasional fatigue. Cancer-related fatigue is different and not completely understood by allopathic medicine. This deep tiredness is not alleviated by sleeping and is one of the most common, frustrating, and long-lasting side effects for many survivors. Although cancer touches one in three women and one in two men nationwide, more people than ever are living longer after treatment. New and promising research heralds the benefits of yoga practice post-treatment. Yoga practices that include movement, breath work, and meditation can help survivors better tolerate residual pain, cancer-related fatigue, lymphedema, peripheral neuropathy, insomnia and anxiety that often accompany treatment and can linger on for years after treatment. Q: I love the Healthy Aging blog. I read it regularly and don't believe you've covered the topic of radiation as a partial treatment for breast cancer. I'm one year out of treatment but my range of motion is limited; it does not interfere with my everyday life but as a yogi I notice a big difference from side to side. The docs haven't given me much info and I believe the skin has been contracting even after the radiation stopped. I've seen a great PT and work on long, slow, passive stretches, but there's still lots of work to do. Any insights? A: Since I am not familiar with this topic, I asked Cheryl Fenner Brown, one of our guest contributors who has worked with many people following treatment for breast cancer, to help us answer this question. 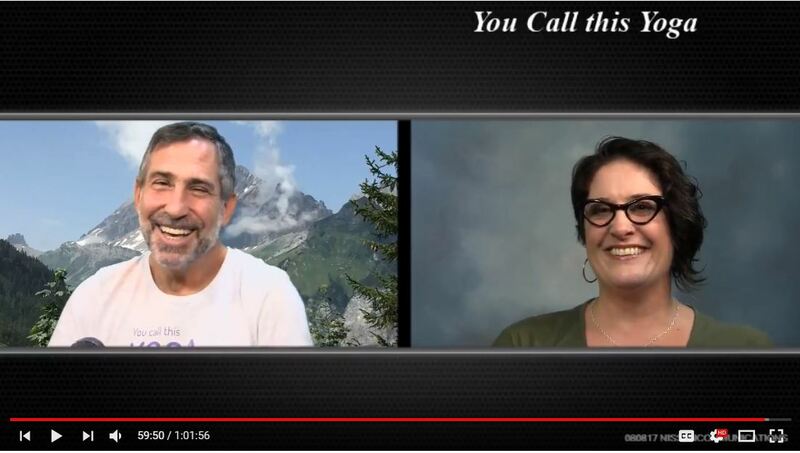 In this episode Howie interviews Cheryl to explore yoga therapy for cancer survivors. What is yoga therapy? This podcast episode explores the question as it applies to people with chronic health conditions and most specifically those undergoing or post-cancer treatment. Cheryl Fenner Brown, a yoga therapist, talks about her work with the Cancer Support Community and the research project which helps frame the training she does with yoga teachers and health care practitioners. Before yoga I was a workout junkie, I would be walking on the treadmill, listening to music, sometimes while reading a book or watching TV. I thought I was helping myself to 'de-stress' but I was just continuing to multitask like I did at my day job. My first experience of yoga was while travelling for work and I hated it because the teacher did not "teach" anything, just modeled the posture and called out their names. When I moved from Virginia to Northern California, I gave yoga a second try in 2001 and was lucky to find a real teacher who asked me to do just one thing and feel how my body and breath were reacting. I knew that this was where the magic would happen. Slowing down, focusing on my internal landscape was an alien concept but one that I took too wholeheartedly. ​I had been teaching adults business process modeling theory and software classes for several years before I became a yoga student. I loved breaking down complex concepts into easy to understand lessons. However, teaching people something they are not excited to learn took a lot of the joy out of being a teacher. When I was laid off from the software job several years later, I had already fallen in love with yoga and decided to make a career of teaching adults something that would help them grow. During my early years as a teacher, I was exposed to many wonderful groups of differently-abled students: those with physical disabilities, back problems, and cancer patients. As a long-term sufferer of back problems myself, I was excited to adapt yoga to their needs. I began to specialize and work with cancer patients, conducted three years of community-based research on yoga and cancer, published several yoga nidra CDs, and a yoga for cancer survivorship DVD. What additional education and experience do you have that contributes to your work as an instructor? I think my initial experience with yoga was when I was very young, probably around 7 years old. I had insomnia as a child and remembered laying in bed observing myself breathe. I tried to figure out the exact moment when I was 'not' observing myself breathe and somehow that helped me to go to sleep. I now know that I was practicing pranayama and that it is impossible to find that exact moment of 'not observing.' Then I started practicing gymnastics which kept me very in touch with the movement of my body throughout high school. I studied philosophy in college and even took Sanskrit for two years, never knowing that I would be using it on a daily basis now. I received my initial 700-hour training from Piedmont Yoga Studio with Richard Rosen and Rodney Yee in 2005. I was always the student asking my teachers, "Buy why do back bends make us feel happy and why do forward bends make us feel relaxed?" Even with such a long initial training, that was not something we had time to cover so I immediately began looking for more education and nine years and 800-hours of yoga therapy training came next. I studied with Joseph and Lillian LePage at the Integrative Yoga Therapy school and I learned all about the subtleties of the practice, the koshas, the chakras, the vayus, mudra, yoga nidra, and mantra. What is the greatest compliment that you have ever received as an instructor? I have taught cancer patients since 2007 and some of my favorite compliments have come from these students. One of my students said after a particularly relaxing yoga nidra class that she was able to forget she had cancer during the practice, what a gift! Another gentleman who studied in India with Sri Adi Shankaracharya mentioned that I am the only Western yoga teacher who teaches like his teacher in India. I don't think an American yoga teacher could hope for a higher compliment as that and I work live up to it every time I teach. What are your future goals as both a practitioner and an instructor? My practice has changed over the years, and where I once desired to do the more difficult postures and practice more head stand and shoulderstand, now I prefer a maintenance approach to my practice. My home practice tends to be close to the ground, meditation, mudra, restorative, and gentle active postures. I do what keeps me pain free and make time for yoga nidra at least once a week. As a teacher, my goal is to find my niche in the Triangle area. I bring a different voice to Patanjali's Place, honed by some of the most skilled western teachers from the Iyengar lineage. My hope is to share the healing and transformative gifts that yoga has to offer. One of my main intentions as a teacher has always been to introduce students to home yoga practice. There is only so much we can learn in class, the true transformation happens on your mat at home when you listen to your own inner wisdom. To that end, I have maintained a website for over a decade that is full of instruction on posture, chair yoga, sequences, breathing, chanting, mudra and philosophy. I also write a weekly blog that outlines what I teach in my public classes for students who want to try practicing a familiar sequence from a teacher they trust, or for students who cannot make it to class that week. This year I have begun filming these classes and making them available online as well. I offer a six month mentoring program for new and seasoned teachers who want to work with cancer patients and other specialized populations. And I offer private yoga therapy and Reiki sessions at my home studio in Durham. ​It's a bit dangerous when I actually leave the house and attend a yoga event of some sort. Inevitably I start talking with a yoga teacher who is doing something really interesting, and I start pitching the idea of a guest post or interview on their area of expertise for the blog. Yep, I'm like that—relentless. Recently, I recently ran into a old yoga friend, Cheryl Fenner Brown, who I hadn't seen in several years—we used to practice teaching each other back in the days when we were training to be teachers—and found out about the wonderful work she's doing on yoga for cancer. As usual I made my pitch, and here's the result. Nina: Tell us a little about yourself and how you got started teaching students with cancer. Cheryl: I came to yoga in 2001 as a stressed out software trainer and gym junkie. After sitting at a computer all day I would rush to the gym and jump on the cardio machines with a book in my hand, music in my headphones, and usually a TV going somewhere nearby. Multitasking was so ingrained in my workday that it infused my workouts as well. The first time I took yoga and was asked to do one posture and breathe, it opened up my eyes to the freedom within slowing down and focusing on one thing. It wasn’t long until I dreamed of blending my work in teaching adults with my new-found love for the yoga practice, and in 2004 I started the Advanced Studies Program at Piedmont Yoga Studio. After the 18-month program I still had so many questions, especially about how certain types of postures affect our emotions and energy. I was always asking, “Why do backbends make us feel happy and forward bends create calm?” I soon realized that more training was in store, and I enrolled in the Integrative Yoga Therapy’s Professional Yoga Therapists program first at Mt. Madonna and then at Kripalu in Massachusetts in 2007. The following year I was approached by Piedmont Yoga Studio to begin teaching a class for cancer patients, and the Living with Cancer program began with financial sponsorship by the Piedmont Yoga Community, a 501c3 organization that brings yoga to people with challenges. I continued to give classes at several other area yoga studios but I realized that I needed to connect with a cancer support group who could direct students into the classes. Then, in 2011 a student connected me with the Cancer Support Community of Walnut Creek, and I now teach two weekly classes and a monthly Yoga Nidra class at their location. As I have continued to teach students with cancer and learned about how deeply this disease affects both my students themselves and their families, I have been humbled by the strength and perseverance I see on a daily basis. Also, I became a satellite caregiver to my father after he was diagnosed with cancer in 2010 and have now lost many friends and students to the disease over the years. I am honored to be able to show these people simple ways in which they can gain back some peace and comfort as they go through this life-changing process. It is truly empowering to witness. Nina: Why do you think yoga particularly helpful for people with this disease? Cheryl: When someone receives a cancer diagnosis, their whole world is turned upside down. Treatment decisions can seem overwhelming, and it is more important than ever to tap into the grounding and healing power that a simple, consistent yoga practice can provide. Then, when treatment begins, there are many side effects that can make recovery quite difficult. Often students complain of fatigue, pain, anxiety, insomnia, digestive issues, reduced cognitive function, neuropathy and lymphedema. Yoga asana, pranayama, mudra and yoga nidra are all helpful tools that can bring balance to the body, ease to the mind, and calm to the emotions. For the past three years I have conducted research into how these yogic practices may help to reduce the side effects of cancer treatment at the Cancer Support Community (the research is fiscally sponsored by the Piedmont Yoga Community). I have gathered some very promising results this year, especially with increasing spiritual and emotional wellbeing. And the latest project is currently underway. You can read more about the project on my website. Research subjects are currently being accepted into the spring 2015 session, so if you or someone you know is interested, contact me at cherylbrownyoga@gmail.com. Nina: Do you have any poses and practices you especially recommend? Cheryl: Yes, I recommend a very slow-paced combination of gentle movements that will stimulate the lymphatic system, which aids the immune system in distributing immune cells throughout the body. Simple movements such as Cat/Cow pose, lateral bends, and twists can be done lying, sitting, kneeling, or even standing so that students can practice with as much or as little activity as they require on any particular day. Calming and cooling pranayama, such as nadi shodhana, and rechaka kumbhaka, are helpful for reducing anxiety and creating a sense of calm. I also incorporate mudras or hand gestures into my classes because they can affect change in the energy, mood, and awareness of the practitioner. Mudras are simple and can be viewed almost like a yoga medicine cabinet; there is a mudra to help almost any physical, emotiona,l or energetic complaint. Restorative practice is also a perfect way to practice during treatment, especially on the days when there is the intense fatigue from chemotherapy and radiation. And, finally, I would recommend yoga nidra, a special form of guided meditation that is profoundly restful and rejuvenating. I have published several yoga nidra CDs that can be purchased or downloaded from my website. Nina: Anything that should be avoided? Cheryl: I would not recommend any intense form of asana practice, such as Vinyasa, Ashtanga, or Bikram, nor would I recommend deep, intense twists, backbends, or inversions. Overheating the body is not advised because traditional western medical treatments create residual heat in the body so the best practices are those that cool, soothe, and calm the body and nervous system. After treatment has ended, students can begin to incorporate more active practices as long as they are comfortable. Nina: For people with cancer and want to get started practicing yoga, what do you recommend? Cheryl: Look for a yoga teacher or yoga therapist who has experience teaching cancer patients, and don’t be shy about telling your teacher that you are undergoing treatment or if you have recently had surgery. Find a class that is billed as gentle yoga or restorative yoga. There may also be cancer support facilities or hospital classes in your area that specialize in yoga for cancer patients, so look around for classes designed specifically for those living with or recovering from cancer. If you’re in the San Francisco Bay Area, I teach public classes in Oakland and Walnut Creek and also make house calls for private yoga therapy. My schedule is online here. Nina: And for teachers who want to teach people with cancer, what do you recommend for special training? Cheryl: I would recommend additional training in yoga therapy or specific training in yoga for cancer patients. There are many great programs out there all over the country. I personally offer a six-month mentorship for 200-hour certified teachers who are interested in working with cancer patients. The mentorship involves attending and assisting one weekly class and three teaching assignments. I am currently accepting applications into the 2015 Yoga for Cancer Mentorship, and you can find out more on my web site. I also teach a weekend intensive Yoga for Cancer teacher training module through the Niroga Institute in May of 2015. You can register directly with them at niroga.org. Nina: Thanks for taking the time to share all this with us, Cheryl. Your work is inspiring! 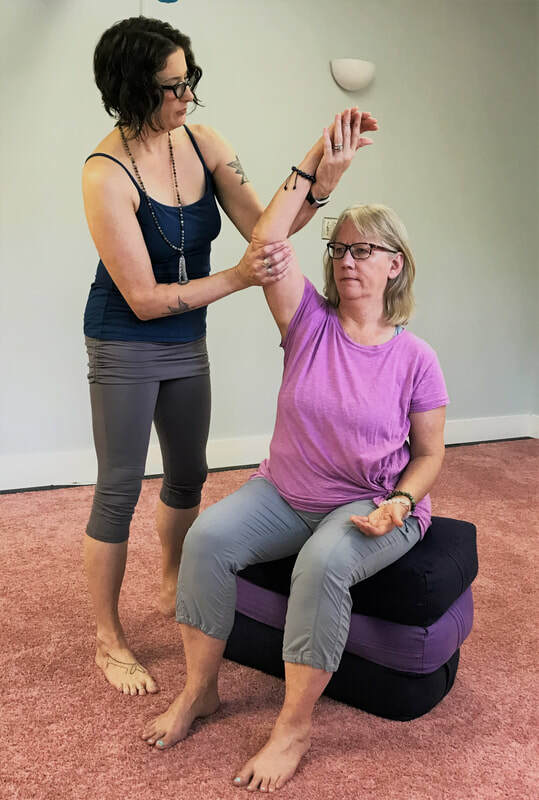 Cheryl Fenner Brown, PYT has trained with master teachers from Piedmont Yoga Studio and the Integrative Yoga therapy schools, and she blends both traditional Hatha teachings and alignment principles with subtle energy work and healing. Students appreciate her unique blend of philosophy, asana, mudra, chanting, pranayama, and yoga nidra delivered with compassion and humor. Cheryl encourages each student to honor where they are in their bodies every time they step onto the mat so deep healing and transformation takes place. With over 420 client hours as a yoga therapist, Cheryl sees clients privately and has taught over 3000 public classes and workshops in studios and cancer centers around the San Francisco Bay Area. She serves on the faculty of the Niroga Institute's Yoga Therapy 800-hour and Piedmont Yoga Studio's 300-hour teacher training programs, and offers workshops and retreats for cancer survivors. She also conducts research on the benefits of yoga for reducing side effects of cancer treatment. Q: How does your Yoga for Healing class differ from other yoga classes? A: Healing Yoga is a very different kind of class in that it combines many healing yoga practices in one experience that is individually tailored to meet the needs of each person who comes into the class. The asana is very gentle, much of it done either reclining, sitting or kneeling and some standing. We bring breath awareness into each movement to not only keep a slow pace but also to use breath as a barometer of how each movement affects the body. I also teach the practice of mudra, or hand gestures that direct prana into the body in particular patterns for both physical and emotional healing. Lately I have been incorporating the sound practices I learned with Ann in the Vak Choir as a way to center the mind before practice. And during the last week of each month I offer Yoga Nidra, a deeply rejuvenating guided meditation practice that guides consciousness between waking and sleeping to access the witness consciousness. I teach a different topic each month and have been working through the chakra system. In September we will work on Ajna Chakra, the third eye. I have found that this unique combination of practices meets students where they are in their bodies each time they come to class and promotes self-acceptance and healing. Q: How did you get into teaching yoga for healing? A: One of my first teaching gigs was at a chiropractors office and students were coming to me with all manner of back and neck problems. I heard time and time again that these clients were somewhat afraid to try yoga because they thought they were not flexible enough or did not want to re-injure themselves. It was then that I knew I wanted to focus my work with people who needed an individualized approach to yoga and found it so rewarding to break down the teaching of postures into easy adaptable steps so that the whole room might be in Triangle pose, but everyone's posture would look a little bit different. One person may be in Supta Padangusthasana II on the floor, while another be in a seated variation on a chair, while yet another may be leaning up against the wall. The key is guiding the student towards reaping the benefits of the pose no matter what might be going on for them on any particular day. My approach to the practice has always been function before form. Q: What do you feel is the key ingredient of healing? A: All of us have the capacity to heal within ourselves but we wear our injuries and old habits of thought, behavior and movement like armor that it may be difficult to let go of because we don't know any different way of being. Yoga is a beautiful tool for uncovering these habits gently and showing us new ways to move and embody the areas of injury and ease alike. The key ingredient of healing any injury or malady is to bring awareness to that part of the body through movement, once healthy movement patterns are established, breath and prana will naturally follow. As we then breathe into these areas in need of healing, old emotional or psychological knots can then be loosened and ultimately released. And the best thing is that this happens without us needing to be aware of it, it is the natural shift of the body and mind towards healing. Q: Do you think the need for healing, and the way we address it, has changed throughout the years? If so, how?